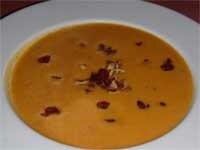 Cap'n Rons: Recipe for Curried, Acorn Squash Soup. 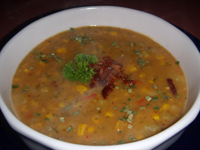 Welcome to Cap'n Ron's, Curried, Acorn Squash Soup. 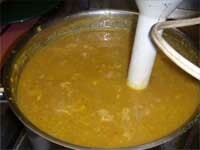 Squash soup is often made as I did my Butternut Squash and Apple Soup. Change the squash, but use similar flavors. I was in the mood for something different, and I figured, that the Jamaican Curry would be the perfect flavor to enhance the natural flavor of the Acorn Squash. 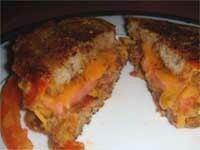 It worked great, with some great, and unexpected flavors, along with just a little bit of heat at the end. It may not be really cold here in South Carolina yet, but I know that it has become soup weather for a lot of you. I kinda miss having a little more winter than I do here, but not enough to move back. Cold weather foods are 'comfort foods' and I've given it a start early. This is the first, along with a nice stew I made to go along with it. If, you don't have Acorn Squash available to you, it's easy to substitute, any that you may have readily available. The only step you'll have to be careful during is when it's time to blend it. I used my immersion blender, and it turned the plastic yellow, that being said, I still think that it was the tool to use. A regular blender, adds a lot of air, while it's blending, and the food processor takes too much to clean. So, there, you have it. This recipe makes about 3 quart, and re-heats to taste just as good as it did the first time you made it. 1. Pre-heat your oven to 350 degrees. Prep the squash by cutting it in half, then scooping out the seat. Place the halved Acorn Squash on a parchment lined sheet pan, cut side down. 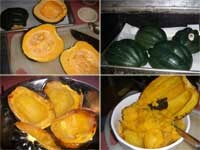 Cook for about 45 minutes, or until a knife can easily be inserted into the side of the squash. Take them out of the oven, and let them cool. When they're cook, you can shred them into a bowl. I used a soup spoon to do this. 2. Mince the onion and cook over medium heat, in a little oil, in the pot you'll be finishing the soup in. 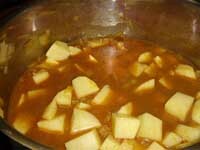 When the onions are almost soft, add the Curry Blend, stir in, then add the potatoes that you've chopped to about 1/2". 3. After you've added the potatoes, cover them with chicken broth. I used about 2 cups during this process. Simmer the potatoes for 10 - 15 minutes. 4. When the potatoes are soft, mash them with a potato masher. Add the cooked squash, and enough chicken broth so that the soup won't spit at you while it continues to cook. 5. 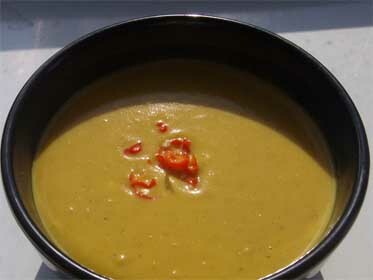 Let this cook for about 10 minutes, the blend the soup. I used an immersion blender for this step, but you could easily use either a food processor, or a blender. Add the Heavy Whipping Cream and serve immediately. 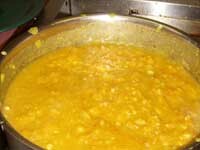 The Curry Blends have the great mix of flavors that go with so many melas, and they contain No Salt! 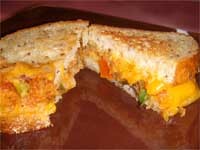 Leftovers can easily be stored in your refrigerator and re-heated when you want more. It'll keep 4 - 5 days, and when re-heated, will taste as good as it did the first day you had it.